Lock the Warner water tower and guard the laboratory because the Animaniacs and Pinky and the Brain are escaping to DVD on July 25, 2006 from Warner Home Video. For the first time, fans can own Animaniacs Volume 1 including 25 episodes featuring the crazy Yakko, Wakko, Dot and crew. Fans can also add to their classic animation DVD collection the 22 episodes from the Emmy nominated series Pinky and the Brain as they attempt to take over the world in Pinky And The Brain Volume 1. Both DVDs are priced to own for $44.98 each and have an order date of June 20, 2006. Pinky and the Brain are two laboratory mice living at Acme Labs whose genes have been spliced. Before each night is over they scheme to formulate a plan to conquer the world. 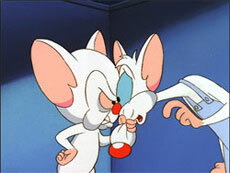 The Brain is a genius who leads the master plan, whereas Pinky is quite insane and the comedic relief for the series. 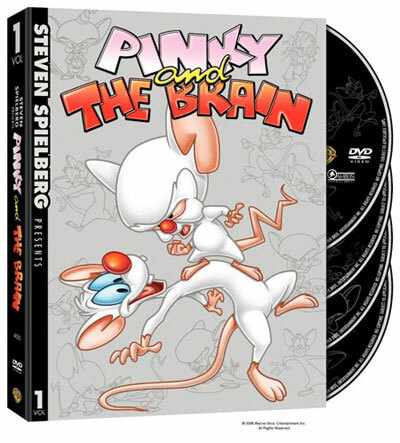 Pinky And The Brain Volume 1 is a 4 disc collectors set, with 22 fun-filled, classic episodes from Steven Spielberg, executive producer of the Emmy nominated series. 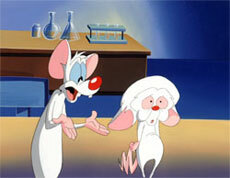 Observe Pinky and The Brain take on each attempt to conquer the world with a dry wit and humor. Originally aired on the WB Television Network, these are two mice allowed to enter your living room! "We are very excited to bring these two one-of-a-kind animation shows to DVD," said Dorinda Marticorena, WHV Vice President WHV Vice President, Kids and Sports Marketing. "Fans of both shows have been eagerly asking about their availability on DVD and even created a petition gathering over 9,000 signatures. We are happy to make these fantastic boxed DVD sets available to their core fans as well as a new generation of animation viewers." * Pinky and The Brain: The Start of All Things Wacky - Featurette with Senior Producer Tom Ruegger, Writer Peter Hastings, the voices of Pinky and the Brain stars, Rob Paulsen and Maurice LaMarche, and voice director Andrea Romano as they discuss antidotes and antics about Steven Spielberg and why they had so much fun at work.